Polaroid Little Girl In Grown Up Clothes Ad 1956 This is a November 12, 1956 advertisement. It is a nice black and white ad from Polaroid Land Camera. Shows a little girl, front teeth missing but with a big smile. She is dressed up in Mommies dress, hat, fur cape and lots of jewelry. . It reads, ""There she as all dressed up in my clothes. I quick snapped her picture with the Polaroid. In excellent condition. Photo is taken through plastic and may show wrinkles or crookedness that is not in the ad. This magazine tear sheet measures 10 1/4"" wide by 14"" tall. 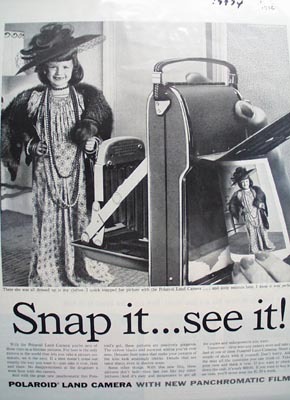 Items Similar To "Polaroid Little Girl In Grown Up Clothes Ad 1956"